Some iced coffees being sold on the high street contain as many calories as a hot dinner, a cancer charity warns. 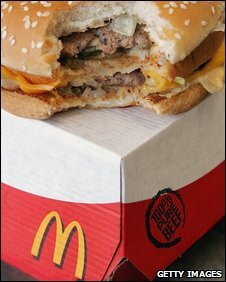 The chief offender had 561 calories, others contained more than 450, and the majority had in excess of 200. It is the combination of sugar, full-fat milk and cream which appears to push some of the cool coffees into the upper echelons of the calorie scale. The World Cancer Research Fund, which identified the drinks' calories, noted healthier versions were available. The "venti" or largest version of Starbucks' Dark Berry Mocha Frappuccino, a limited offer for the summer, contains 561 calories - more than a quarter, WCRF notes, of a woman's daily calorie intake. Take away the whipped cream and it has 457 calories. The smallest version, without whipped cream, provided 288. But even some options with skimmed milk are high in calories. At Caffe Nero, the skimmed version of a Double Chocolate Frappe and a Mocha Frappe Latte contain 452 calories, WCRF said. Costa Coffee's summer offerings are rather more modest but may still contain more calories than a chocolate bar. The Massimo Coffee Frescato contains 332 calories, while the primo-size, the smallest available, just under 200. WCRF said it was highlighting calorie content, because after not smoking, maintaining a healthy weight "is the most important thing you can do to help prevent cancer". In fact it suggests people should become as lean as possible without being underweight. Earlier this year it estimated that 19,000 cancers a year in the UK could be prevented if people lost their excess weight. Dr Rachel Thompson, Science Programme Manager for WCRF, said: "The fact that there is an iced coffee on the market with over a quarter of a woman's daily calorie allowance is alarming. "This is the amount of calories you might expect to have in an evening meal, not in a drink. "As a general rule, if you want to have a coffee, go for an unsweetened version with skimmed or semi skimmed milk as this is likely to contain fewer calories. It is also worth steering clear of ones that contain lots of cream or sugary fruit syrups as these tend to be higher in calories." A spokesperson from Starbucks said its Dark Berry Mocha Frappuccino was only one "of over 87,000 beverage variations". It noted these others included an ordinary coffee, containing four calories, an iced Americano, containing 11 calories, an iced caffe latte with skimmed milk, containing 68 calories "to more indulgent options on offer which our customers may choose from time to time". In a statement, Costa said it took "the nutritional balance of all its food and drink very seriously. "Currently we provide a nutritional breakdown for consumers on packaging. Full nutritional analysis of all our food and drink products is also available in all of our stores and on the Costa website. "Costa seeks to provide customers with a choice of products across its drink and sandwich range, meeting all key health trends; allowing them to choose healthy options if they so wish." Caffe Nero was not available for comment.